Windows 10 insider preview build 16257 sports the Eye Control feature along with new colour schemes, Microsoft Edge improvements and lots more. You’ll need a Tobii enabled device in order to test the new Eye Control Features. On August 1, Microsoft announced that they will introduce an Eye Tracking (beta) feature in their latest installment of the Insider Preview. On August 2, Microsoft announced the Windows 10 Insider Preview Build 16257 for PC, which sports, the Eye Control feature. Talk about fast! The Eye Control, however, requires the Tobii Eye Tracker which doesn’t come cheap. You will find it pre-built in high-end gaming laptops such as the Alienware 17, Acer vNitro, MSI GT72 and some monitors such as the Predator XB271HUT, Predator Z271T and more. The Eye Control feature is primarily focused on ALS (Amyotrophic lateral sclerosis) and neuro-muscular affected patients who are unable to control a PC traditionally using a mouse and keyboard. The gestures for Eye Control range from gazing at apps to launch them or using an onscreen keyboard to glance at characters and type out words. 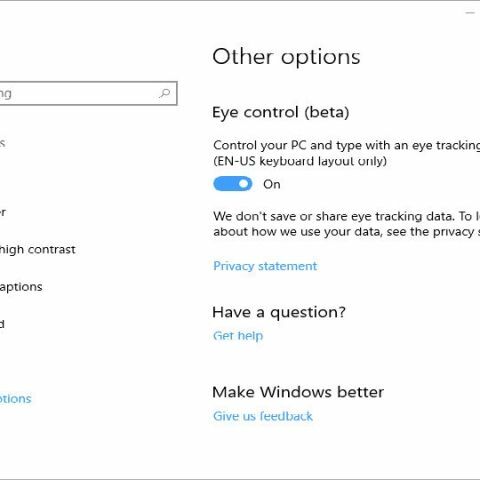 Microsoft, on their blog, said, “Yesterday, we announced Eye Control, which makes Windows 10 more accessible by empowering people with disabilities to operate an on-screen mouse, keyboard, and text-to-speech experience using only their eyes. The experience requires a compatible eye tracker, like the Tobii Eye Tracker 4C, which unlocks access to the Windows operating system to be able to do the tasks one could previously accomplish with a physical mouse and keyboard”. The Eye Control feature currently only supports EN-US keyboard layout but they assured to add support for more in the future. There are many nifty features of the Eye Control such as the Eye Control mouse which enables you to control the mouse pointer using your gaze, the Eye Control keyboard along with what Microsoft calls “Shape writing”. It essentially lets you type by looking at the first and the last letters of a word and “simply glancing at letters in between.” Microsoft says “a hint of the word predicted will appear on the last key of the word,” and if the prediction is incorrect, you can swap it out with another predicted alternative. There’s also Eye Controlled TTS which works similar to the Eye Control keyboard except it reads the written sentences and words out loud. Other updates to the existing features include Edge UI tweaks which overhaul the look of the browser, updated colour console. The latest test build also adds quite a few Windows Defender Application Guard (WDAG) improvements. You can read more details about the update in the Windows 10 insider preview here.